The fastest way to assemble open segment vessels. Each SegEasy plate has a set number of segment channels separated by a ridge that creates the gap between those segments. Using trigonometry, the number of segments plus the gap factor arrives at a single angle which you must use to cut segments that fit the channels on that particular disk. Since the geometry is likely different on each plate, this cutting angle will be different for each plate. 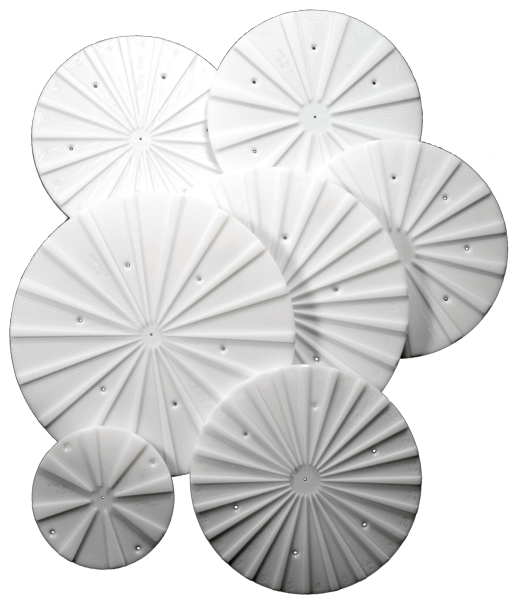 The geometry of each plate is etched onto each plate. This shows the number of segments, the number of degrees for each gap and the cutting angle to be used to cut segments. In addition, a channel number is etched onto each channel. For each plate, you must configure Woodturner PRO so that all calculations will be correct. First, set the Row Type to Open Segment. Second, set the number of segments to match the plate. Finally, change the number of degrees for the gap to match that of the plate. Important Note:All SegEasy plates have been factory center-drilled for use with the Stomper. Looking for a fast, accurate and affordable way to easily assemble open-segmented vessels? Help has arrived! The Woodturners Studio™ SegEasy™ Plate takes hours off assembly time by enabling the user to accurately assemble an entire layer for glue-up all at once! SegEasy plates will benefit not only beginners to open-segmented turning, but experienced turners as well.